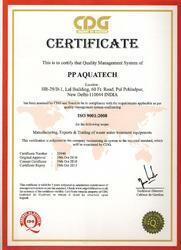 We, PP Aquatech, an ISO 9001:2008 certified company, have been the supplier, manufacturer, trader and exporter of water and waste water treatment equipments since our inception in 2009. In a short span of four years, we have established our presence throughout the length and the breadth of the country. We have successfully distributed a large number of water treatment products and equipments. Through our venture, we aim to contribute significantly towards water pollution control and waste management, thus helping in environmental conservation. Our solutions help in tackling the pressing issue of water shortage. Our sole aim has been to provide high quality, effective and highly functional products. Our products find usage in various industrial and other applications. Due to our quality products, we have attained a huge clientele from all across the globe. Under the guidance of " Mr. Jai Prakash (Proprietor)", we have created a niche for ourselves in this industry. We follow a standardized process for the production of our products. All our products are manufactured using high grade material that has been procured from only the most trustworthy of suppliers in the market. Our services are top notch, with our personnel being highly responsive to the customer needs. 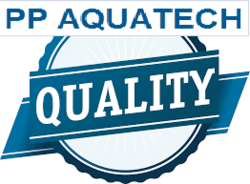 PP Aquatech is committed to produce products of international standards using world class technologies and process to ensure the satisfaction of its customers. For maintaining such standard, the company has developed the global tactics of production which ultimately results the final products to be the best among all. We follow a strict quality control course at each level of production, ensuring that only the best featured products will be handed to the clients. The pool of professionals continuously shares their expertise for maintaining and improving quality. A strategic model which revolves around Solutions, Services and Technologies with an ultimate aim of Pollution Prevention product and Resource Recovery. An approach focusing on continuous value addition to clients and life cycle cost advantage in products. Committed to delivering a total engineered package, customized to one’s needs, based on single source solutions approach. Offering facility management services on water, sanitation and utilities front. Achieved leadership through technology and services. An aggressive latest technology focused strategy with keenness to learn and grow, and willingness to take calculated risks. Continuous interactions with reputed Indian Institutions such as HAL Amethi, JP Associates Bagga, Solan, Eco Paryavaran, Chandigarh etc. for technical backup and tie-ups. Pursue growth aggressively and strengthen our position further in ‘Water supply augmentation through equipments for waste water treatment & recycling. Intensify search of Indigenous technologies and setup R&;D systems and practices. We are backed by a strong and well-developed infrastructure, which is fully equipped with hi-end machines. Based on the same, we are able to deliver small as well as bulk orders within the stipulated time-frame. Besides, we also maintain our machines in top most condition that has assisted us in maintaining quality of our machinery and equipment. Quality is the prime motive of our organization; therefore we leave no stone unturned to provide flawless range of Industrial Machinery and Equipment. Our team of quality check controllers keeps an eye on all the stages of production right from the procurement of the raw materials to the final dispatch.